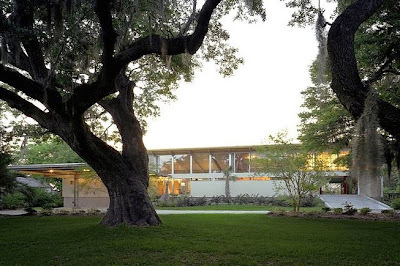 The American Institute of Architects (AIA) recently announced the 17 recipients of the 2009 Housing Awards. The AIA’s Housing Awards Program, now in its ninth year, was established to recognize the best in housing design and promote the importance of good housing as a necessity of life, a sanctuary for the human spirit and a valuable national resource. The jury recognized projects in four award categories: One/Two Family Custom Housing, One/Two Family Production Housing, Special Housing, and Multifamily Housing. All of the following are from the One/Two Family Custom Housing category. I wasn't too interested in the rest of the winners. You can check them out at the link above if you're so inclined. This 1400 square foot main house and guest house/ garage is located on a heavily wooded cliff site with views out over the San Juan Islands of Washington State. The plan orients to major views south down the coast line and west out to the islands while being careful to stay outside of the drip line of the dominate Douglas-fir trees. The goal of the project was to create a modern, eco-sensitive, urban retreat that was kid tough and kid friendly. Materials, details and connections are visible expressions of the design and construction. This is exemplified in the intricate staircase where water jet-cut steel stringers support translucent acrylic treads and risers. 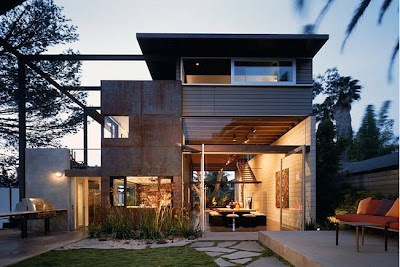 The house was designed and built using sustainable design principles. Energy efficiency, low consumption and low toxicity were key ideas. Montecito Residence is a single-family home set in the fire-prone Toro Canyon. The owners wanted a house that minimized its use of scarce natural resources and recognized the challenging environmental conditions of the area. 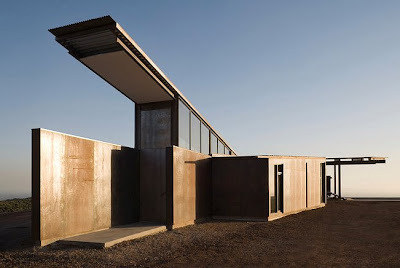 The raised roof functions as an umbrella to shield the house from the sun, while the long central hallway allows naturally cool offshore breezes to move through the space. The hallway also creates an axis dividing the private from the public. The long, one-room-deep floor plan gives each room windows and porches overlooking Shem Creek. A modern interpretation of Charleston’s historic shutters provides protection from harsh weather and summer sun. Operable windows provide natural cross-ventilation and lighting. Approaching the house under a canopy of moss-draped live oaks and up a gentle ramp, the view of the marsh appears like an element in a Japanese painting. 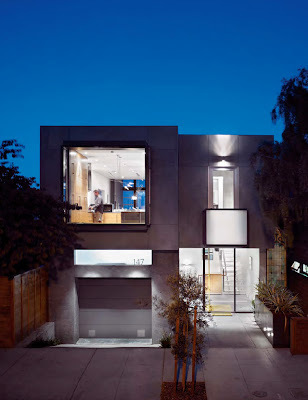 The objective for this eco-friendly residence in Venice, California was to: design a high-performance home that dissolves the barriers between indoors and outdoors; utilize raw, honest materials appropriate to the bohemian grittiness of the surrounding community; and have the smallest carbon footprint in balance with lifestyle. 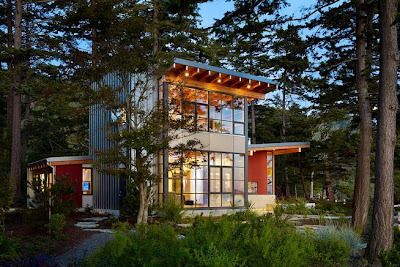 The house design takes full advantage of the local climate such that a net zero energy building is obtained. A significant issue was how to root the house to the earth; the nearly flat site in a young growth forest offered no footing. By reshaping the topography, the architects were able to establish the first level slightly below grade and sculpted the surrounding terrain into a gentle rise. The house functions on multiple levels - as much an intimate retreat for two (or one) as an accommodating host to an extended family (or numerous guests).